I absolutely adore Italy and each time that I go I seem to discover something new about this country which I hadn’t noticed before. 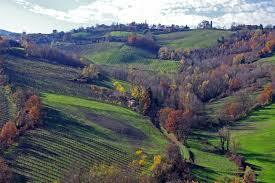 I have traveled through most regions in Italy but without question my favourite has to be Emilia Romagna. This Italian region, like many others, is well known for its outstanding cuisine and beautiful destinations and I wanted to take you through of my favourite places to visit in this northern Italian area. If you are looking for an authentic Italian experience, these are the places that I suggest you go to. Two of the best known food products from this Italian region come from Parma which are Parma ham and of course, Parmigiano Reggiano cheese. When it comes to these foods, you can actually take tours within the city where they will show you how the foods are made, and where they came from. Away from the food side of things however, you will definitely enjoy the beautiful Duomo cathedral and simply wandering around Parma is a perfect way to spend the day. If you are looking for the best place for foodies, Parma is where you need to go. Bologna is the capital of Emilia Romagna and it is a must visit location, it can also be used as the perfect base to go off and visit other areas of the region. Bologna has a great nightlife and so if you weren’t planning on doing much sleeping in Emilia Romagna, this is the place to be. During your time in Bologna, there are three activities which I recommend that you don’t leave before you have completed. The first activity is climbing the Torre degli Asinelli one of Bologna’s famous twin towers, the second activity is to have long at Past Fresca Naldi a place that has become famous throughout the country fro its delicious fresh pasta and finally you should take a walk to the beautiful Luca Sanctuary, just a short walk from the city centre. I love the class and the luxury that Italy offers and one of my favourite things to do, especially in the big cities, is to watch out for the supercars which roam the city streets. Here in Modena then, I found the perfect place to spot beautiful cars and if you are a car lover, this is the place where you should be headed. Modena is home to the Ferrari Museum in Maranello where you can learn all about the past and the future of this world-famous car brand. Modena is a great place to take a day trip during your time in the region. Another great place for a day trip, especially if you are staying in Bologna, is Ferrara, an old town with an ancient Jewish neighbourhood, a stunning cathedral and the jewel in the crown is the stunning moated castle complete with apartments and prison cells. The castle is right in the centre of the city and the other attractions are all close by, a great place to spend you day. Have you been to Emilia Romagna before? What were your favourite spots? Let us know your thoughts in the comments below.